I have been told, with a serious face, that one day High-Western Capitalism will either crumble under the weight of its own inequity, collapse with a blinding world-historical revolution, or simply fall out of fashion with the Powers That Be. But despite the shrill conviction of the red-and-black Left, my crystal-ball tells me that Das Kapital is here to stay, in one form or another, and that we ought to dress accordingly. I say “in one form or another” because, though I wholeheartedly defend a kind of free market, my kind of tricks and transformations are sure as hell not on the side of Business-As-Usual. From my skewed perspective, and from the perspective of game theorists, economics majors, and silicon tycoons, Capitalism runs on the same principles as the simplest Game— desire, parameter, contract, competition, and finally strategy. When only one team fully understands the rules, object, and dynamic of the struggle (or that they are even playing at all) we could expect nothing more than a brutal lop-sided assbeating. And this seems the condition of the modern consumer— either hopelessly gullible or embittered beyond the point of good sportmanship. So central to my job description at The Center For Experimental Living, is cooking up devious new gameplans for the underdog lay-public to spring on the overly-prepared Business World. Basically, we put the “con” back in “consumer.” We nudge the public to exploit the wonder and dynamism of commerce while cleverly dodging the evils of commercialism. Instead of structural reforms and referenda, we turn to more mysterious means— magictricks and life-games that arouse the rent-a-cops in Loss Prevention. We’re trying to democratize economics, making it safe again for the silly and conscientious and larger souls among us…. II. Low-Level Solutions for Middle-America. “Low-level” means that, for most of the following life-games, No Special Assembly is Required, no fancy arrangements or rearrangements in the actual structure of the American Marketplace; no crazy legwork, special collectivity, legal contracts, legal counsel, legerdemain, reservations, credit cards— just transformation on a walk-in basis… A change, first, in meanings. III. The Supermarket, a Testcase For HeadcasesWe’ll begin our experiments, then, in the Supermarket, the ostensible stronghold of Necessity— catering to the biological demands of Food, Water, Hygiene, and Idi Amin Pez-dispensers. 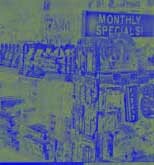 Our task is to drum up Desire within the grid of Necessity, parlay browsing into jouissance, and circumvent/negate the commercial destinies of Piggly-Wiggly. I always enter the Supermarket with a gallop. I get hysterical, and my retinae drink the flood of fluorescent light— a great big glowing nocturnal Parthenon, with free balloons and automatic doors that I open psychokinetically, like the last American Jedi. After riding the quarter-run Cowboy Carousel, I hurry to absorb the vastness of the grocery store, the immense organization at hand, the encyclopaedic showcase of human necessities, with floorplans engineered to slow and trap drifting customers. With my identity concealed behind a gorilla mask, I dive headlong into the shopping experience. First, we feast on the free samples (found often at either warehouse ‘Buy-4-Less’ stores or upscale Supermarkets with sushi and large wine selections). At Harris Teeter, here in Charlottesville, I stab cubes of turkey and cheese with toothpicks, shamelessly stuffing my face in front of the deli-workers. On the dessert menu, I can munch on buttercookies, guarded by the large cartoon alligator, or I might “sample” nonchalantly from the fresh cherry selection, or the barrels of self-serve candy. Now, I’ve eaten; I’ve extinguished any desire to fulfill the prima facie Purpose of the Supermarket, i.e. purchasing food and drink and magazines and mouthwash. Everything now springs from Desire rather than Necessity. From out front, we select our shopping carts with great care, for the race demands a fit machine. Gentlemen, start your engines— Within minutes, I’m zipping through Pet Supplies with my brother in hot pursuit. After several laps, the finish line is within my grasp, until I swerve sharply to avoid a plastic fish, losing my footing and flipping over my cart. My brother maniacally speeds away with victory singing in his heart…. Though they may validate your presence in the eyes of the store managers, shopping carts are, in truth, stealthy vehicles to a higher Silliness. Silliness is, ofcourse, the very opposite of Seriousness, which does not mean “importance, sincerity, or meaningfulness” as it is sometimes invoked by Serious People. Seriousness is the refusal to accept, understand, or utilize the contingency of the world. Serious people think that Bisquick pancake mix or luncheon meat are not the kind of things we should toy with. The silly, on the other hand, exult in the absolute contingency and plasticity of the world, while feeling deeply its “importance, sincerity, or meaningfulness.” Silliness is not fluff, bubbles, and birthday cake. Silliness is the ability to laugh at everything in the universe, all in one breath. It is ecstasis without mysticism, without transcendence, without any respect for Bisquick or the claims of Necessity. “The Big Switcheroo”—— The object of this game is to transport the entire stock of a certain product to other, properly incongruous regions of the store. The modus operandi is subtle: using a shopping cart, we smuggle only five or six at a time, and cover those products with doormats, for added security. By this method, we managed to move the entire stock of enemas to the Nabisco snack aisle; the vegetable oil to the laxative section, and the pregnancy tests to, of course, Children’s Toys. The game ends when store security decides its time to go. It’s best suited for team play, seeing how ten players on twenty shoppers could get rather ugly, rather quick. A tip for beginners though: grab your own grocery cart as subterfuge, and walk comfortably in their midst. Park yourself near an unsuspecting victim, and pretend your reading the ingredients off boxes of instant muffin mix. When they reach for the peach jam on the high shelf, dodge left and make your move.